Alstom has been awarded a contract worth $52 million by Shanghai Shentong to modernize 68 metro cars in service on the Shanghai metro line 5 and to supply traction and train control management systems for 198 new metro cars due to circulate on the existing line and its extension, expected to open by the end of 2017. Shanghai’s metro line 5, which was opened in 2003, is 11 miles long and includes 11 stations. The extension will add 10 miles and 9 stations, providing more fluidity to the line which is particularly dense between Fengxian District1 and Minhang District2. Alstom will supply traction systems for 198 new cars3 that have been ordered for the line and its extension. All traction drives will be manufactured by Alstom’s joint venture SATEE (Shanghai Alstom Transport Electrical Equipment Co. Ltd.). “This new contract will strengthen Alstom’s position in China. 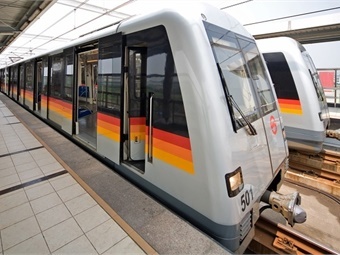 The great performance of the metro cars in Shanghai over the last 13 years, our 16 years of expertise in the supply of traction system in China, as well as our 25-year experience in train modernisation have been essential in the award of this contract. Alstom is committed to accompanying its customers in Shanghai and elsewhere in China to offer efficient, reliable and comfortable mobility solutions to passengers,” said Ling Fang, Managing Director of China & East Asia of Alstom. Since 1999, Alstom has provided 1,222 metropolis metro cars including traction for seven metro lines4 in Shanghai. More recently, Alstom supplied the traction for 210 additional metro cars on Shanghai Line 4.